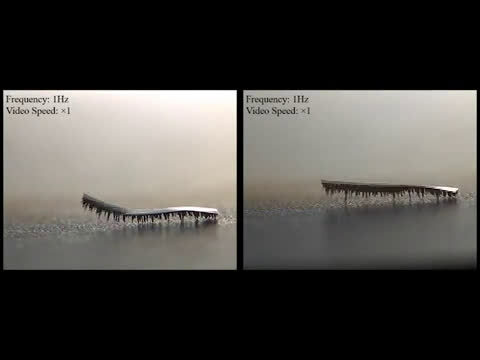 Researchers at City University of Hong Kong (CityU) have developed a tiny, soft robot with caterpillar-like legs capable of carrying heavy loads and adaptable to adverse environments. This mini delivery robot could pave way for medical technology advancements such as drug delivery in the human body. 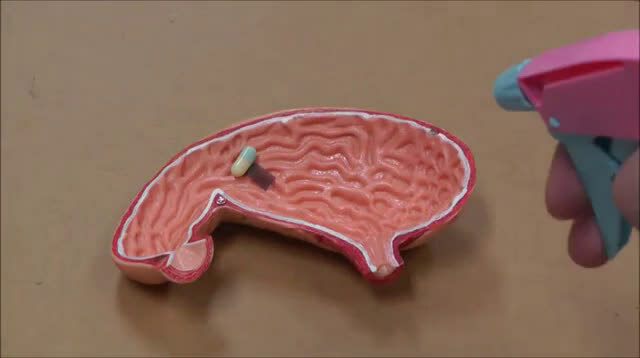 Around the world, there has been research toward soft milli-robots. But the CityU's new design reduces friction significantly so that the robot can move efficiently inside surfaces within the body lined with, or entirely immersed in, body fluids such as blood or mucus. 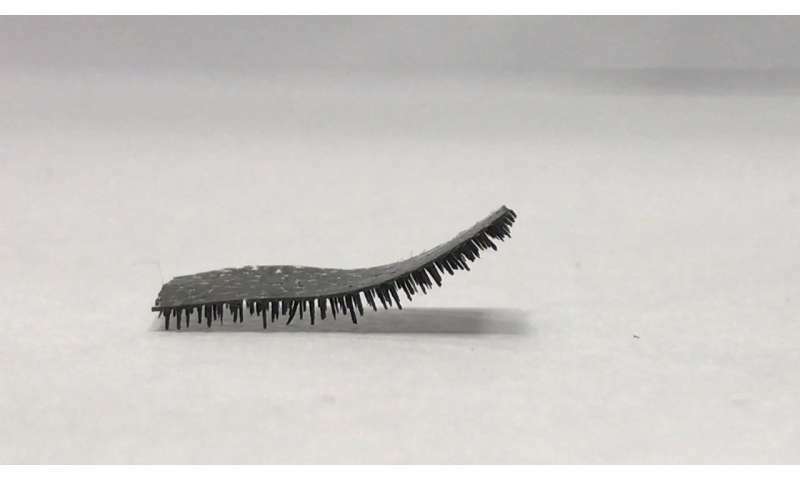 The research findings have been published in Nature Communications, titled "A Bio-inspired Multilegged Soft Millirobot that Functions in Both Dry and Wet Conditions." This milli-robot has hundreds of long, pointed legs measuring less than 1 mm, resembling tiny hairs. The research team studied the leg structures of hundreds of ground animals including those with two, four, eight or more legs, and studied in particular the ratio between leg length and the gap between the legs. "Most animals have a leg-length to leg-gap ratio of 2:1 to 1:1. So we decided to create our robot using the 1:1 proportion," explains Dr. Shen Yajing, Assistant Professor at CityU's Department of Biomedical Engineering (BME), who led the research. The robot's body thickness measures approximately 0.15 mm, with each conical leg measuring 0.65 mm long and the gap between the legs measuring approximately 0.6 mm, making the leg-length-to-gap ratio around 1:1. Moreover, the robot's pointed legs have greatly reduced their contact area and hence the friction with the surface. Laboratory tests show that the multi-legged robot has 40 times less friction than a limbless robot in both wet and dry environments. Apart from the multi-leg design, the materials also matter. The robot is fabricated with a silicon material called polydimethylsiloxane (PDMS) embedded with magnetic particles that enable it to be remotely controlled via electromagnetic force. "Both the materials and the mutli-leg design greatly improve the robot's hydrophobic properties. Besides, the rubbery piece is soft and can be cut easily to form robots of various shapes and sizes for different applications," says Professor Wang Zuankai at CityU's Department of Mechanical Engineering (MNE), who conceived this research idea and initiated the collaboration among the researchers. Controlled by a magnetic manipulator used in the experiments, the robot can move in both a flap propulsion pattern and an inverted pendulum pattern, meaning that it can use its front feet to flap forward as well as swinging the body by standing on the left and right feet alternately to advance respectively. "The rugged surface and changing texture of different tissues inside the human body make transportation challenging. Our multi-legged robot shows an impressive performance in various terrains and hence open wide applications for drug delivery inside the body," says Professor Wang. The research team further proved that when navigating an obstacle 10 times higher than its leg length, the robot's deformable soft legs are capable of raising up one end of its body to form an angle of up to 90 degrees to cross the obstacle easily. And the robot can increase its speed by increasing the applied electromagnetic frequency. The robot also shows a remarkable loading ability. Laboratory tests showed that the robot was capable of carrying a load 100 times heavier than itself, strength comparable to an ant's—this is the equivalent of a human being lifting a 26-seat mini-bus. The amazingly strong carrying capability, efficient locomotion and good obstacle-crossing ability make this milli-robot extremely suitable for applications in a harsh environment, for example, delivering a drug to a designated spot through the digestive system, or carrying out medical inspection," adds Dr. Shen. Before conducting further tests in animals and eventually in humans, the research teams are further developing and refining their research in three aspects: seeking a biodegradable material, studying new shapes, and adding extra features. "We are hoping to create a biodegradable robot in the next two to three years so it will decompose naturally after its meds delivery mission," says Dr. Shen.